It needs to be ported with latest fltk. I don't have time at the moment, so you're welcome to do the port. This is a modification of fluid so that you can edit code with your favorite text editor instead of the code editing dialog. A status window is also added at to the top of main widget browser window. 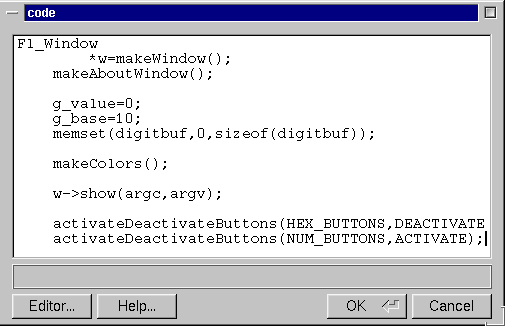 The reason is I don't like a window pops up all the time when I save the code. The message is written to the status area now. Please look at the Screenshots. I hope you'll find these features useful. fluid stands for Fast Light User Interface Designer for the freely available cross platform toolkit (written in C++) called fltk. I play with almost all freely available cross platform toolkits, I find fltk is the cleanest (and very fast) of all. And most of all, lots of fun to code with. I'm not a fan of GUI builders but fluid is a GUI builder I really can use which does not get on my way. 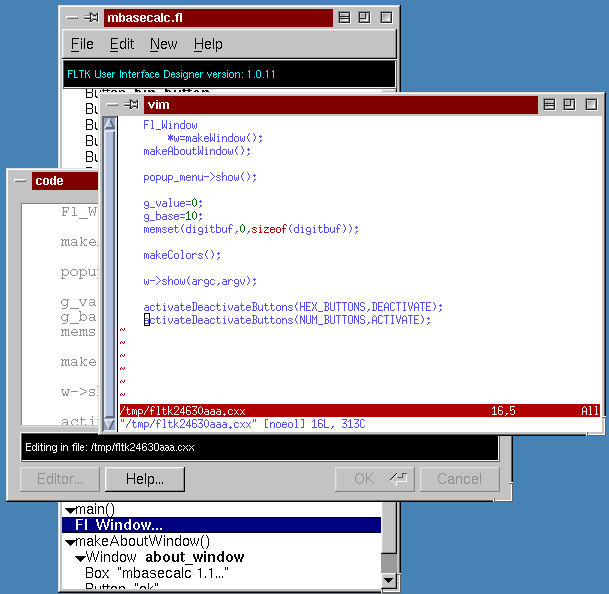 The code is tested on Linux and Windows NT/2000. The shortcut for the Editor button is Alt+e. Click on the Help button in the code panel for more info. A temporary file name with extension .cxx is passed to the editor to edit the code. 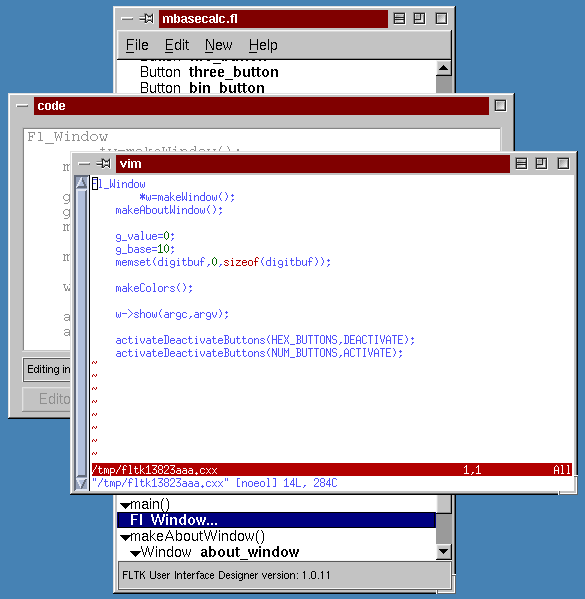 Figure 2 - editing code with vim in ansi xterm. If you find this option useful, please let me know. Bug reports, suggestions are always welcome. Thanks to Bill Spitzak and others for writing/maintaining fltk, a fine cross platform toolkit. Status box is moved at the bottom of the window (look at the old screen shot) and the color is changed to gray. Code change by Yucel Adnan adnan.yucel@lmco.com.